The R980AT tyre changer, a popular alternative to the R980XR, is easy to operate, rugged and equipped with a power assist tower to help when mounting low-profile performance tyres. The Ranger NextGen™ series R980AT tyre changer performs masterfully on a wide variety of wheels, including virtually all OEM configurations and performance tyre and wheel configurations. Its power assist tower is an absolute must-have feature if you work with low-profile and high-performance wheel configurations. The R980AT features the latest in design and wheel service technology, and it provides the best value and performance in its class of tyre changers. The swing-arm on the R980AT is one of this tyre changer’s most useful features. When dealing with run-flats and stubborn beads, the power assist tower will safely secure the edge of the tyre, moving along with the activated turntable. The bead will almost always seat without a struggle. Try this on a stubborn bead without the swing-arm, and you’ll be at it for a while, wasting your precious time. A high-torque electric turntable efficiently spins tyres to seat or remove beads. With reverse-direction foot pedal controls, you’re in total charge of your tyre changing operation. The turntable is the only electrical component in the tyre changer (everything else is air-powered), and it requires very little support or maintenance over time. Tough sidewalls? No problem. A traveling drop-center tool makes changing tyres easy. Ranger tyre changers offer increased safety and efficiency, and the drop-center tool is essential to the entire operation. A swing-in disc can also help loosen beads by using safe pneumatic power that won’t damage your tyres. Ranger motors have it all: rugged copper rotor construction, high-quality bearings, thermal-cool epoxy insulation and durable rolled steel frames. Foot pedal controls make for hands-free operation of the turntable, and all pneumatic locks and switches are easy to reach. To ensure a low-friction environment, steel and aluminum cylinders work together to reduce machine vibrations. End-of-stroke cushioning protects seals, wear bands and pistons bands from excessive forces, prolonging the life of the tyre changer. Balanced flywheels also help reduce vibrations in your equipment. The less stress on your machine, the longer it lasts. The bead-breaker’s speed is significantly increased due to our included bilateral pneumatic accelerators. They’re just as effective in reverse too! The cylinder won’t react if moisture is detected in the air. This eliminates any chance of rust or corrosion due to condensation or extreme humidity. A multi-axis, adjustable blade permits multi-angle tyre capacity, while the large, dual-flange axle prevents the blade from flexing or failing. Your Ranger tyre changer features a powerful bead breaker ​blade that won’t stress the rest of the machine as it breaks beads, and it returns smoothly when it detaches from the tyre. This smooth return reduces shock loading and wear on the cylinders. An equi-dimensional, hardened alloy steel mount and demount head assists tyre beads during all tyre changer operations. Protective plastic covers ensure steel never contacts the wheel, protecting custom and high-performance wheel types at all times. A 100% polymer head is also interchangeable with the steel head. Industrial-grade, 45-micron, pneumatic control valves feature die cast and machined bodies constructed from zinc and aluminium. High-performance polyurethane seals and self-lubricating Teflon® piston guides help make your tyre changer stronger and longer-lasting. Valve plungers feature muffled extrication ports that blow away dirt and other contaminants each time the valve goes into the release position. Ranger’s exclusive RimGuard™ wheel clamps come standard on the R980AT tyre changer, and this massive turntable allows them to expand ​762 mm. Dual multi-tooth jaw sets permit internal and external clamping, and the vertical-mount design reduces the time you spend on each tyre. Your R980AT tyre changer has a geometric tabletop that makes bead lubrication fast and easy to inspect. No heavy, rusted-out cast-iron foot pedals here! Forged steel is long-lasting, lightweight, durable and won’t corrode over time. The snap-action pedals immediately return to starting positions when released. The pedals’ high responsiveness prevents tyre tears and considerably speeds up operations. Multi-link rod connections support non-binding plunger movement and better bilateral control. High-pressure polyurethane pneumatic tubing is outfitted with a seamless bore for better flow rates. The tyre changer also benefits from high abrasion resistance, high burst tolerance and maximum kink resistance. 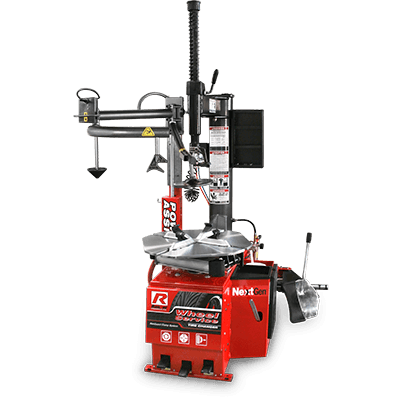 Ranger’s TurboBlast™ bead seater is a Ranger tyre changer exclusive. It simply forces air into tyres with stubborn beads, seating them quickly when simple inflation won’t do the trick. A nylon discharge barrel has a locking tab that sits right on the edge of the rim. This design makes it easy to aim and control the intense air burst. You’ll enjoy your tyre changer’s hands-off gearbox. It never needs maintenance and has a massive oil and grease reservoir for improved heat dissipation and component lubrication. Internal baffles and a constant seating stress flange gasket assure positive, leak-free venting. Also to your benefit, Ranger prefers precision helical gears in our tyre changers instead of loud, clunky spur gear transmissions. Get more with your tyre changer purchase. We include a soap bucket and brush, plastic wheel protector kit with turntable jaw covers, bead-breaker blade boots, specialized mount/demount head covers and a hardened steel tyre iron and bead lever tool. None of the electrical terminals, auxiliary switches or motor enclosures are left unprotected. Dust and other shop contaminants are kept out too. The internal cavity of your tyre changer will always be clean—another way we extend the life of your equipment. The R980AT has a drive belt that evenly disperses wear and improves belt support. Flex-bonded cords and flex-weave covers keep away oil, heat and other contaminants that threaten the efficiency of the machine. A 45 mm spring-assisted hexagonal vertical tool shaft and hardened-steel horizontal outrigger support arm ensure the mount-demount tool head remains stable and precisely aimed. Inflate tyres without lifting a finger. The tyre changer features a sure-grip clip-on valve chuck on the inflation hose (for hands-free operation), and an air pressure dump valve lets you release air from the tyre. Your Ranger R980AT tyre changer is more than capable of handling motorcycle tyres. Motorcycle clamps are sold separately and increase your shop’s service capabilities.